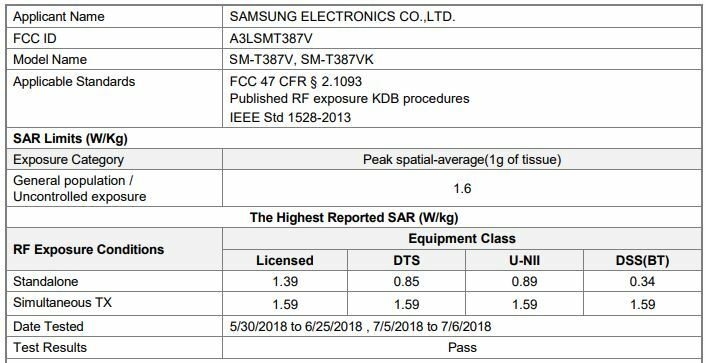 The entry-level Samsung Galaxy Tab A spotted previously in Geekbench passed through the FCC recently, indicating that the unit might soon hit the shelves in the United States through Verizon. The tablet was tested by the FCC using LTE Bands 2, 4, 5, 7, and 13, and was identified by the regulatory agency by the now-familiar model number SM-T387V. 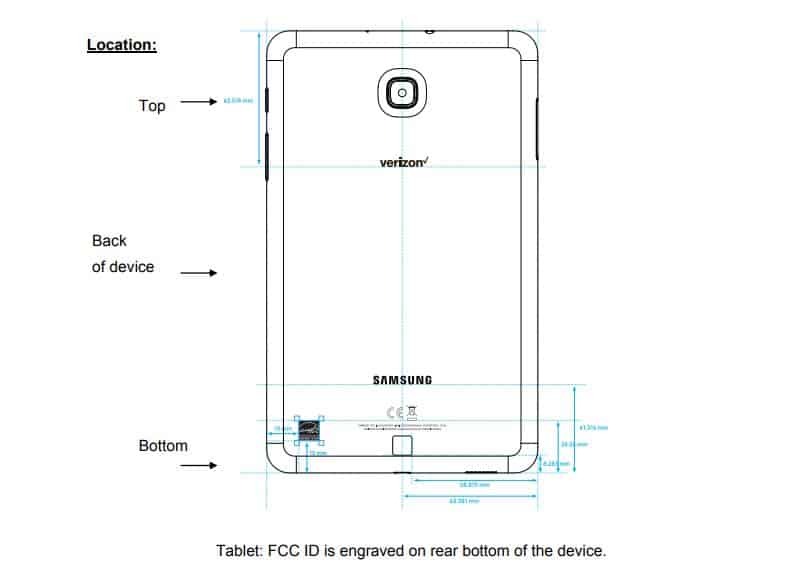 If that wasn’t enough to link the slate with the US-based carrier, a sketch depicting the FCC label stuck to the tablet’s back panel also highlights a prominent Verizon logo. The same sketch also reveals that the unit should have a 3.5-millimeter headphone jack at the top, a USB connector and a loudspeaker at the bottom, a rear-facing camera that doesn’t seem to be accompanied by a flash, and the usual side-fitted volume and power buttons. The FCC documents further reveal that the slate was tested on the Wi-Fi 2.4GHz, 5.3GHz, 5.6GHz, and 5.6GHz bands, and that the unit should also take advantage of Bluetooth connectivity. Also worthy of note is a second model number variation mentioned in the FCC documents, i.e., the SM-T387VK, and while there’s no clear indication of what the ‘VK’ suffix might entail, it could be viewed as a hint that the tablet won’t remain exclusive to Verizon in the United States. As usual, the FCC documents don’t reveal a lot about the software experience or internal hardware details of the device, but the SM-T387V was also benchmarked online earlier this month and Geekbench painted a clearer picture of what the slate should offer to consumers. The list included an 8-inch display and a Snapdragon 430 chipset from Qualcomm, representing a slight upgrade over the Samsung Galaxy Tab A 8.0 (2017) that launched with a Snapdragon 425 silicon in tow. The same benchmarking tool also revealed 2GB of RAM – same as last year’s model – and finally, the unit should rely on Android 8.1 Oreo, although seeing how the tablet belongs in Samsung’s portfolio, it’s very likely that the OS will be covered by the Samsung Experience UI. As yet there’s no official word on when the SM-T387 will hit the shelves but different variants including Verizon’s have already been approved by the Wi-Fi Alliance, and last year’s model was launched in September so the sequel could follow a yearly launch schedule. 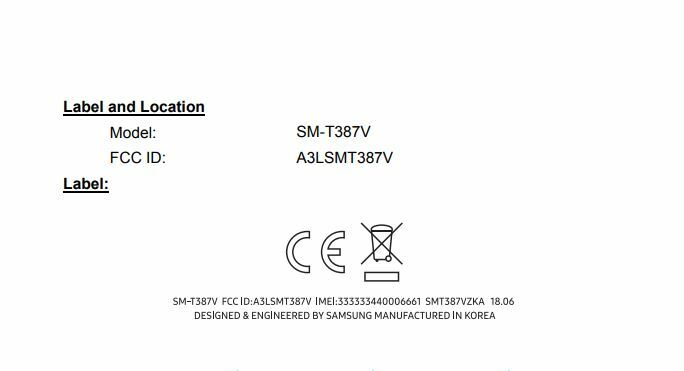 The post Samsung Galaxy Tab A SM-T387V’ For Verizon Visits The FCC appeared first on AndroidHeadlines.com |.